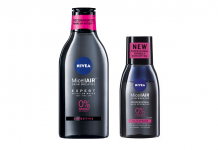 Nivea has just renovated in April 2010 its anti-wrinkle pilar range. 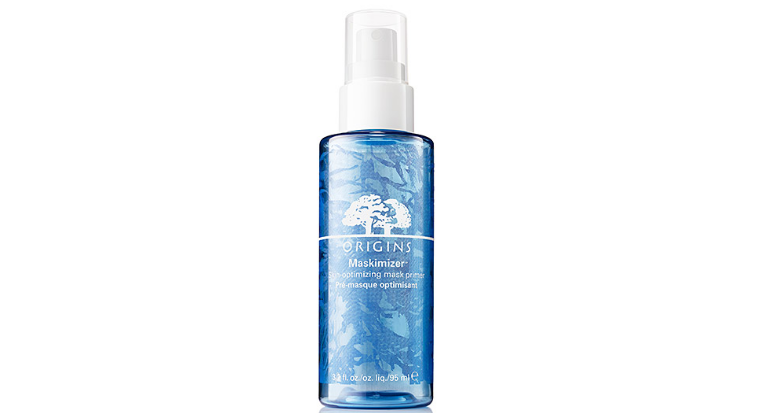 The Day formula has now an improved UVA protection, and a new active ingredient. O/W emulsion based on the following surfactant : Glyceryl Stearate / Croda Myrj S40 (PEG-40 Stearate), co-emulsified with Cetearyl Alcohol, thickened and stabilized by Carbomer and Carrageenan (Chondrus Cripsus) polymers. The oil phase is made of Shea Butter (Butyrospermum Parkii Butter), C12-15 Alkyl Benzoate (ie Finsolv TN by Innospec) – usually used as UV filter solubilizer -, Microcrystalline Wax (Cera Microcristallina), Paraffin Oil (Paraffinum Liquidum) and Caprylic/Capric Triglyceride (Miglyol 810 or 812 by Sasol) for non-silicone oils, and Dimethicone for silicone oils. The oil phase also contains oil-soluble UV filters : Ethylhexyl Salicylate (Symrise Neo Heliopan OS), Butyl Methoxydibenzoylmethane (DSM Parsol 1789) and Octocrylene. The formula structure (surfactants, thickeners and oils except the UV filters) is the same between this new version of Q10 Plus and the previous one. The formula is protected against microorganisms by Phenoxyethanol, Methylparaben. It contains also Benzyl Alcohol, which can be here for its anti-microbial properties, or because it is an allergen (their mention is mandotory in Europe on cosmetic products). The formula also contains co-preservative agents : Methylpropanediol (Stéarinerie Dubois Dub DIOL) and Ethylhexylglycerin (Schülke and Mayr Sensiva SC50). The formula also contains Trisodium EDTA as sequestrant. The active ingredients are the same between this new version of Q10 Plus and the previous one. Only UV filters are different. INCI name of Coenzyme Q10 : present in the body and implied in the cellular energetic cycle, it is commonly used as a dietary supplement due to its antioxydant properties. First introduced in cosmetic on the market in 1998 by Nivea in its Q10 Anti-Wrinkle range, Q10 is presented by the brand as the “anti-wrinkle already in your skin”. These results were presented in May 1998 by Beiersdorf in Boston at the First Conference of the International Coenzyme Q10 Association. 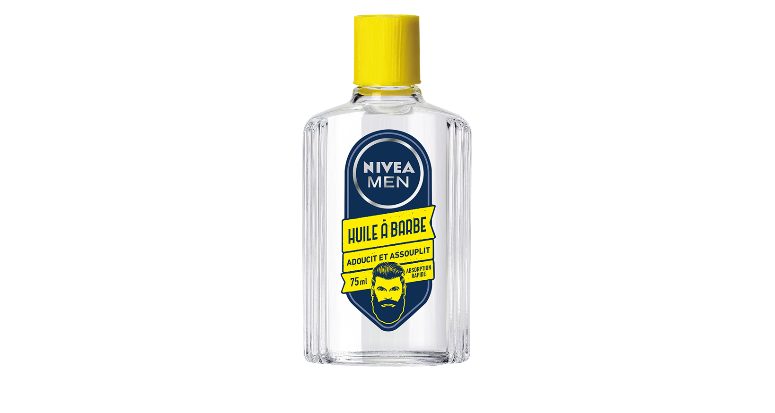 Beiersdorf is one of the supportive members of this association. Coenzyme Q10 is not just another “marketing active ingredient” for Beiersdorf, but a strategic ingredient studied continuously by its labs. – patent EP0859592 filled in 1996 protects compositions containing combinations of Sterols and Ubiquinone. Extract of Anise. Already present in the previous version on Nivea Q10 Day Cream, there are very strong probabilities that this extract of Anise is the same as the one used in Nivea Expert Lift under the trade name “Bioxilift“. No reference is made upon this active ingredient in the current communication of the Q10 range. In Expert Lift communication, Bioxilift is presented as “a 100% natural extract from the Anise plant – to support the tightening and firming of the skin, leading to a defined contouring effect”. According to Beiersdorf patents WO2006128781, WO2006128778, WO2006128777 and WO2006128780, Bioxilift / Pimpinella Anisum Extract is an active ingredient supplied to Beiersdorf by Silab. Moreover, Silab owns the trade name “Bioxilift” for Europe since 2004, and Beiersdorf owns it for other countries since 2007. Bioxilift was in the Silab’s catalogue in 2004, but is not available in current Silab catalogue. This Pimpinella Anisum Extract seems to be an exclusivity of Silab for Beiersdorf (the french mini-site dedicated to Expert Lift says about Bioxilift that it is “exclusively producted for Beiersdorf”). – Tocopheryl Acetate : Vitamin E derivative. The change made in the UV filter system is the major difference between the previous and the new version of Q10 Day Cream. According to Nivea, the UVA filtration has been increased. One important point to look at in UV filter systems is their photostability. As explained in this article, if a UV filter is not photostable, it is degraded under UV exposure, and loses its protective efficiency after a certain period of time. In the previous Q10 Day Cream, the UV filter system associates Ethylhexyl Methoxycinnamate (Parsol MCX) and Butyl Methoxydibenzoylmethane (Parsol 1789), which is known to be none-photostable. In the new formula, Ethylhexyl Methoxycinnamate (Parsol MCX) has been replaced by Ethylhexyl Salicylate and Octocrylene. First, Octocrylene brings a short-UVA filtration to the formula, and secondly, the association of Octocrylene and Butyl Methoxydibenzoylmethane (Parsol 1789) is photostable. We do not have the percentages of each filter used in these formulas. 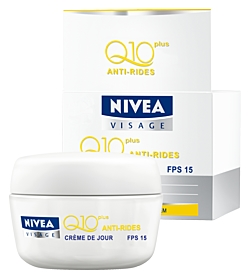 However, we can say that Nivea improved the UV filter system of Q10 Plus Cream, making it more photostable. The UVA filtration has possibly been improved too through the use of Octocrylene. Even if Nivea had a UVA protection in its previous version of Q10 Plus Day Cream, the UVA protection factor (“Persistent Pigment Darkening”) was certainly behind 1/3 of the SPF value, requiring a rework of the formula. This also explains this renovation of Q10 Plus Day Cream. This renovation of Nivea pillar Q10 Plus Day Cream SPF 15 is mainly a renovation of the UV filter system, presented as a “improvement of UVA filtration”. The structure of the formula remains the same, a very classical yet very stable and liked by consumers. As usual, the formula contains only the necessary active ingredients, here Ubiquinone and Beiersdorf’s extract of Anise. This one is not discussed so much in Q10 Plus communication. The main evolution is made on the UV filters : it has been improved to a more photostable association, leaving Ethylhexyl Methoxycinnamate/ Parsol MCX for an Ethylhexylsalicylate + Octocrylene association. 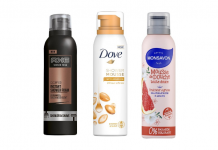 One could assume that this change has also and maybe mainly been made to make the Q10 Plus Day Cream compliant with European regulation on sunscreen products. Guerlain Abeille Royale Youth Watery Oil – pearls are back ! I am shocked that Nivea has included Limonene in their new Q 10 day cream, as Limonene is: Phototoxic ! The definition of Phototoxic is: Causing skin pigmentation, when skin is exposed to sun ! I have used this product for 5 years, and will not be buying the new version. Do you have stock of the old product, that I could purchase ? After 2 days of using this cream I developed an itchy red rash. After 3 days ths rash had developed into an inflamed, red, raised weepy rash that was all over my face and neck. I am currently off work and my Dr has prescribed a strong steroid ecsthma cream to get rid of it. Do not use if you have sensitive skin! I only used this cream once, developed a red, raised and inflamed rash all over face and neck, eyes puffy and swollen; still there 3 days later! Don’t think I’ll be using it again, my skin isn’t that sensitive either. I also only used this cream once,same as Mel developed very red raised irritated rash all over face.Took antihistamines but following morning eyes were puffy tho’ redness slightly reduced. I prefer the old formula rather the new one. when i started using the new formula I have burning sensation on my skin especially when i sweat.